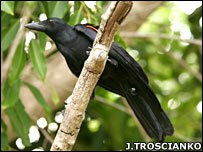 Miniature cameras have given scientists a rare glimpse into how New Caledonian crows behave in the wild. The birds are renowned for their sophisticated tool-using ability, but until now, observing them in their natural habitat has proven difficult. But specially designed "crow-cams" fitted to the birds' tails have shed light on the creatures, recording some tool-use never seen before. The research is reported in the journal Science. Why not just stick a camera to a crow, hitch a ride with it, and get a crow's eye view of what is going on? But while these clever crows have been extensively studied in captivity, looking at their natural behaviour in the wild is tricky. Christian Rutz, lead author of the paper from the Department of Zoology at the University of Oxford, UK, said: "These birds are notoriously difficult to study in the wild. "They are very sensitive to human disturbance and the terrain in New Caledonia is very mountainous and forested, so it is difficult to follow the birds." So the team came up with another approach. "Why not just stick a camera to a crow, hitch a ride with it, and get a crow's-eye view of what is going on?" Dr Rutz said. Recent advances in mobile phone technology enabled the researchers to construct a camera that was small enough to attach to a crow's tail without impairing its movements. They attached the 14g (0.5oz) units - which also contained a radio tag to transmit location coordinates - to the tail feathers of 18 New Caledonian crows. The footage, broadcasted to the researchers' custom-built receivers, provided the team with a unique insight into the crows' behaviour - including some that had never been seen before. Dr Rutz told the BBC News website: "Before, we thought the crows targeted their tool use at fallen dead trees where they probe for grubs; but now we have observed them using tools on the ground - and that has never been seen before. "We also filmed them doing this using a new type of tool, which was very surprising. We found them using grass stems - and that is interesting because these stems have very different physical properties from the sticks and leaves that we knew they use. "They are using the grass stems on the forest floor, probing the leaf litter, possibly fishing for ants." Dr Rutz said: "What were the ecological circumstances on this one particular island in the South Pacific that could have fostered the evolution of this behaviour?" One idea, he said, was that the behaviour may have evolved in response to food shortages. "When we compared situations when the crows did and didn't use tools, we found two pieces of supporting evidence for this," Dr Rutz said. "Firstly, the prey encounter rate was surprisingly small: for one hour of ground foraging a crow would only pick up eight tiny morsels of food - a blackbird in a garden would be taking up that many items a minute. That shows maybe foraging without tools is indeed challenging in this habitat. "Secondly, when you compare the size of the food items they get with and without tools - when they don't use tools, the food items are very, very small indeed compared with the food items they extract with the tools. This again suggests maybe they need to use tools to gain access to this rich hidden food resource." The team says its video tracking technique could be used to study other wild birds that are shy or live in inaccessible habitats. 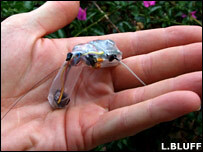 Dr Rutz added: "This technology could really change the way we study wild birds."